Gulf Coast Dermatology may have a new name, but they’ll always have the same unwavering commitment to their Wiregrass patients in Dothan and Enterprise, Alabama, delivering the highest level of medical, surgical and cosmetic dermatology services. From treating common skin conditions like acne, eczema and skin allergies to removing skin cancers, Dr. Jeff Stricker and his team use the latest technologies and treatments to care for our community. Dermatology Specialists of Alabama also offers the most up-to-date cosmetic treatments at their full-service, physician-supervised Aqua Medical Spa in Dothan. Services include light-based phototherapy for the rejuvenation of aging skin, lasers and cosmetic injectables. Aestheticians provide body contouring with non-invasive CoolSculpting® and Venus Freeze for skin tightening and the reduction of cellulite, as well as a full menu of spa services to revive and restore the skin, like facials, peels, microdermabrasion and waxing. Aqua Medical Spa also carries a full line of prescription-grade and organic skin care products. “With our physician-supervised spa, clients can be assured that they are receiving the safest, most effective treatments for restoration, rejuvenation and revitalization,” Dr. Stricker says. On July 6th, Dermatology Specialists of Auburn, Huntsville Dermatology Solutions and Gulf Coast Dermatology announced that they will be changing their name to Dermatology Specialists of Alabama. 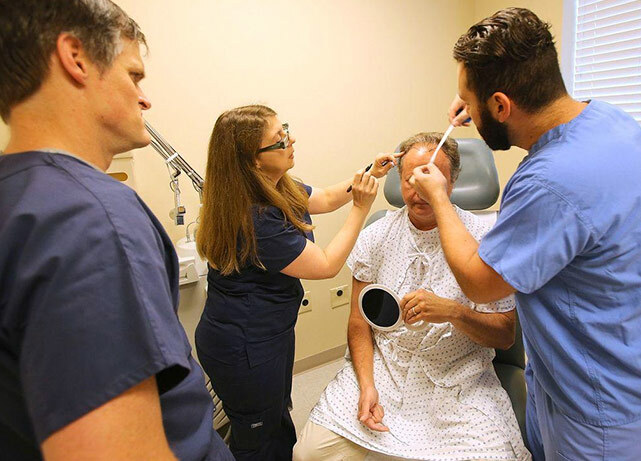 Board-Certified dermatologists, Dr. Kevin Nash, Dr. Jeffrey Stricker and Dr. Robert Calcote believe their new unified name better reflects the growth of the practice across the state. They now serve patients in the communities of Auburn, Dothan, Enterprise and Huntsville, with the same, continued mission — to provide exceptional care for their patients and dedication to the prevention, early detection and treatment of skin cancer. Skin Cancer Questions? Skin Cancer Answers. Skin cancer affected more than 2 million Americans in 2013 and more than 3 million individual cancers were diagnosed. Because we know that ultraviolet radiation causes 90% of skin cancers, the key is to limit exposure, especially in those at highest risk for skin cancer. The majority of these types of skin cancers is highly curable. Basal cell carcinoma, the most common form of skin cancer, and squamous cell carcinoma, the second most common form, rarely spread beyond the skin. Melanoma is the most lethal form of skin cancer and is fortunately the least common of the three main types of skin cancer. Melanoma affected nearly 80,000 people in 2013, causing more than 9,000 deaths. The rates of melanoma continue to rise, largely affecting young women, and it is now the most common cause of cancer death in young adults ages 25 to 29. Scheduling a comprehensive skin screening with Dermatology Specialists of Alabama? We encourage you to take the time, not the risk, and schedule your appointment for a comprehensive skin screening by calling us at (256) 533-1160.